Backbone at Auckland Arts Festival redefines contemporary circus with its own ethereal, gravity-defying and thought-provoking interpretation. Internationally renowned Australian company Gravity & Other Myths have created an innovative eighty-minute show that follows a fluid, tight-knit troupe as they perform impressive stunts and unique ensembles keeping the audience enthralled throughout. 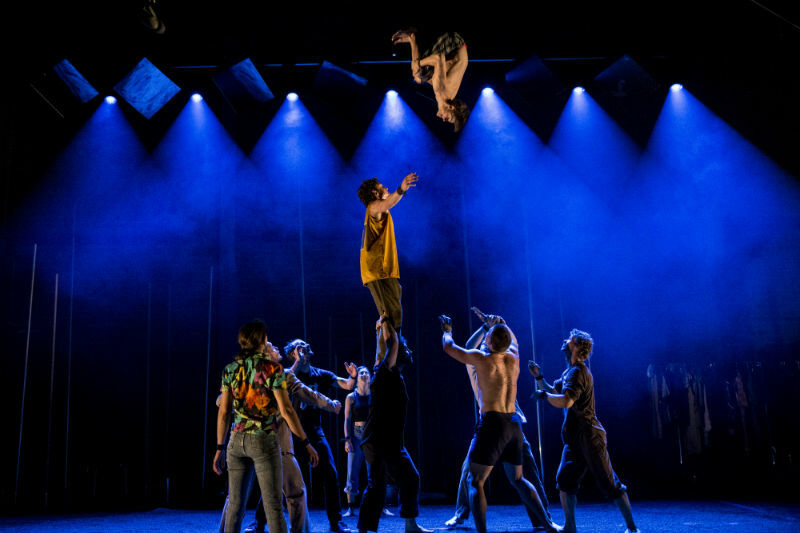 Comprised of ten acrobats and two musicians, the show opens with the twelve performers laid out on the ground, pieced together alongside their props in what could almost be described as a life size jigsaw puzzle. From there, Backbone builds slowly, beginning with the group stripping down their clothes and re-dressing in those of their companions. This is a practice that is repeated throughout, removing any gender constraints as the men adorn dresses and the women, overalls. The props used are tied into each act in very visual and inventive ways. The theme of nature is heavily emphasised and made especially evident through their incorporation of rocks, wooden poles and buckets of dirt. The accompanying music, performed by the two musicians of the troupe, was timed to the movement of the acrobats so that the two flowed together seamlessly and each effortlessly complimented the other. An incredibly talented bunch, the Gravity & Other Myths Backbone is a circus show deserving of all its praise and recognition. Simple a joyous display to behold. Auckland Arts Festival continues until 24th March.